Puma FUTURE CAT S1 ATOMISITY men's Shoes (Trainers) in Blue / Silver Leather, Available in men's sizes. 6,6.5,7.5,8,9,9.5,10.5,11. Free Next Day Delivery and Free Returns on all orders! Puma FUTURE CAT S1 ATOMISITY men's Shoes (Trainers) in White-White Leather, Available in men's sizes. 6,6.5,7.5,8,9,9.5,10.5,11,12. Free Next Day Delivery and Free Returns on all orders! Puma Puma Smash L men's Shoes (Trainers) in Black / White Leather, Available in men's sizes. 6.5,7.5,8,9,9.5,10.5,11. Free Next Day Delivery and Free Returns on all orders! Puma ARIAL EVOLUTION men's Shoes (Trainers) in Black / White Textile, Available in men's sizes. 6,6.5,7.5,8,9,9.5,11,12. Free Next Day Delivery and Free Returns on all orders! Puma ST RUNNER NL men's Shoes (Trainers) in MARINE / White Textile, Available in men's sizes. 10.5,11,12. Free Next Day Delivery and Free Returns on all orders! Puma FTRTRNMC SLIPSTREAMHI REGAL men's Shoes (High-top Trainers) in Black , Available in men's sizes. 6,6.5,8,9,11. Free Next Day Delivery and Free Returns on all orders! Puma CATSKILL CITI SERIES CANVAS men's Shoes (Trainers) in Blue Textile, Available in men's sizes. 6.5,9,9.5. Free Next Day Delivery and Free Returns on all orders! 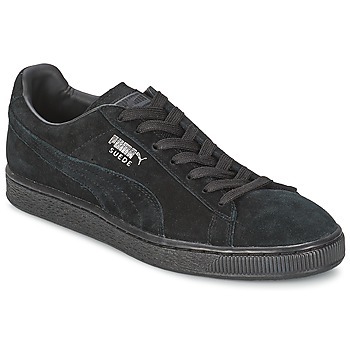 Puma SUEDE CLASSIC+ men's Shoes (Trainers) in Black-Dark / SHADOW Leather, Available in men's sizes. 6,7.5,9,9.5,10.5,11,12. Free Next Day Delivery and Free Returns on all orders! Puma DRIFT CAT 6 SF NM men's Shoes (Trainers) in Black-White Leather, Available in men's sizes. 6,7.5,11. Free Next Day Delivery and Free Returns on all orders! Puma F ATHL TANK women's Vest top in White , Available in women's sizes. M,XS. Free Next Day Delivery and Free Returns on all orders! Puma AFRO GIRL T women's T shirt in Grey , Available in women's sizes. S. Free Next Day Delivery and Free Returns on all orders! Puma PUMA GRADE REPORTER men's Messenger bag in KAKI Textile, Available in men's sizes. One Size . Free Next Day Delivery and Free Returns on all orders! Puma REBOUND STREET L men's Shoes (High-top Trainers) in White Synthetic, Available in men's sizes. 9,10.5,11,12. Free Next Day Delivery and Free Returns on all orders! Puma REBOUND STREET L men's Shoes (High-top Trainers) in Grey Synthetic, Available in men's sizes. 6,6.5,7.5,8,9.5,10.5,11. Free Next Day Delivery and Free Returns on all orders! Puma Grade Portable men's Pouch in Grey / Black , Available in men's sizes. One Size . Free Next Day Delivery and Free Returns on all orders! Puma Ferrari LS Portable men's Pouch in Black , Available in men's sizes. One Size . Free Next Day Delivery and Free Returns on all orders! Puma RATAM men's Jacket in Grey , Available in men's sizes. M,S,XXL. Free Next Day Delivery and Free Returns on all orders! Puma FILOO men's Jacket in MARINE , Available in men's sizes. L,M,S,XL,XXL. Free Next Day Delivery and Free Returns on all orders! Puma KATIO men's Jacket in Black , Available in men's sizes. L,M,S. Free Next Day Delivery and Free Returns on all orders! Puma CA STYLE DOWN JACKET men's Jacket in Grey , Available in men's sizes. XL. Free Next Day Delivery and Free Returns on all orders!